Hard for You to say "I'm Sorry?" 1. Be truly sorry that you upset the other party. Even if you wouldn’t be hurt by the same behavior, understand that this person was—and that their feelings are important to you. 3. Commit to not letting it happen again. Let the person know that you’ve learned from this mistake, and that you’ll change your behavior. Provide specifics about what you’ve realized, and what you’ll do differently. People in a passive-aggressive loop may need to take steps to ensure that the injustice is not repeated. This might involve checking in with themselves every day to ensure that they have kept their commitment, or asking their partner to raise a flag immediately if they sense a new transgression is about to happen. 4. Express appreciation for having the other person in your life. Tell the person whose feelings you hurt how important their relationship is to you. 5. Ask for forgiveness. By making a request for forgiveness, you are reinforcing your earlier message that the relationship is important to you. You are also allowing the offended party to decide the outcome of the exchange—which can be challenging for you. Realize that the offended person may need some time to decide, especially in the case of a major transgression. I think this is such great advice. 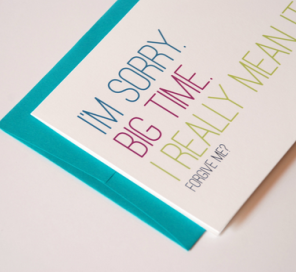 It is easy to say, “I’m sorry.” It is more difficult to acknowledge the issue and commit to working to make amends. Andrea’s post made me realize that an apology can be more of a process than a one time statement. It is not only the words, but the actions following the words, that matter. Check out my review of Andrea’s great book on eliminating passive aggressive behavior. I will be reviewing her new book on Mindful Anger soon. Both books have great tips and exercises on how to communicate more effectively, how to manage conflicts and how to use your feelings to your benefit. She uses clear examples and gives actionable advice. Super helpful! Any thoughts on the art of apology? Please leave them in the comments. PS. Don’t forget to check out my active giveaways!